In case you haven't noticed, it's snowed a bit recently in town. And any time it snows in Alberta, I get excited that it's likely been snowing up in the mountains. And that means skiing! As of December 7, the website OnTheSnow shows that Marmot Basin (the closest ski hill to Edmonton) has a snow depth of 90 cm. That sounds rather decent, and certainly right at the end of November it got a massive dump - but how does that actually compare to normal? I decided to figure out. 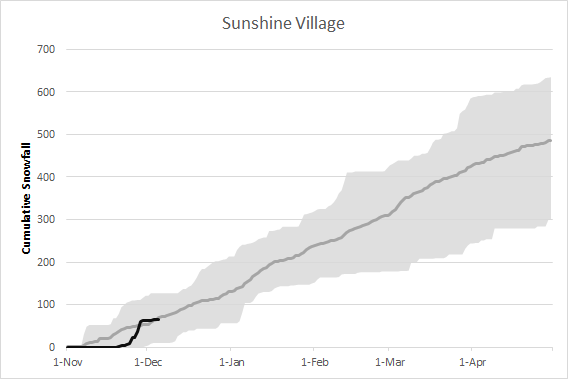 For these graphs, the grey zone represents the maximum and minimum values over the last seven seasons, the light grey line is the average, and the black line is this season so far. So there's good news and bad news here. The good news is that there's actually quite a bit more snow this year so far than normal! 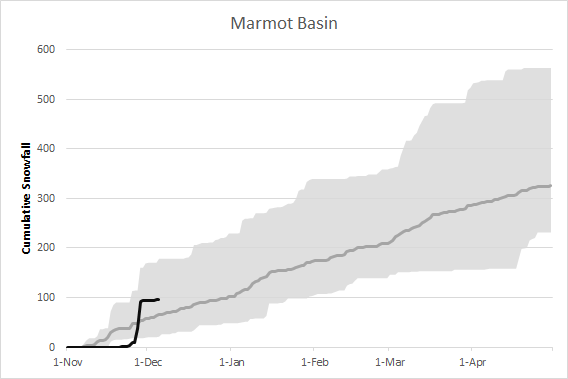 In fact, there's about as much snow at Marmot right now as there typically is by about January first. All in all, maybe not a bad time to go there, in fact! The bad news is that, apart from two huge dumps, there really hasn't been any action in Marmot. 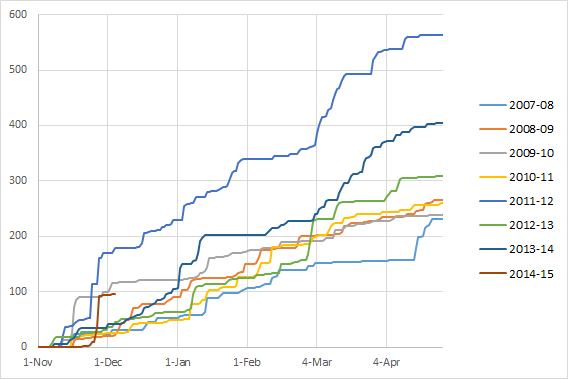 It was way below any of the previous seasons measured until two weeks ago. Marmot looks like it's in a good position now, but if it hadn't gotten luck at the end of November it would pretty much just be rocks. 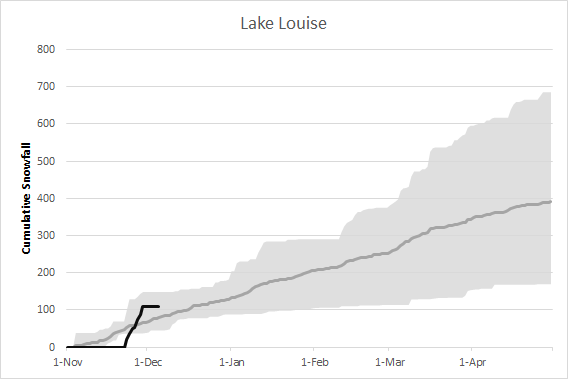 In fact, we can tell it *has* been lucky - Marmot Basin typically only gets two to three snowfalls exceeding 20 cm per day per season (actually 2.43 average), and has already had two this year. Lucky for it now, but it's hard to predict for the future of the season. 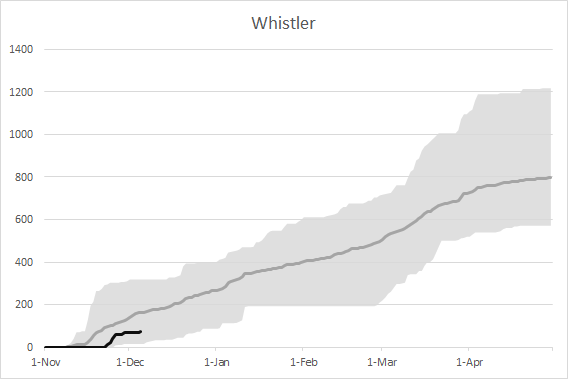 Marmot Basin is also relatively easy to predict - on average by the end of the season, its total snowfall has a coefficient of variation of 37.1%. It also has a reasonably early season, with 100 cm of snow fallen on average by December 31. 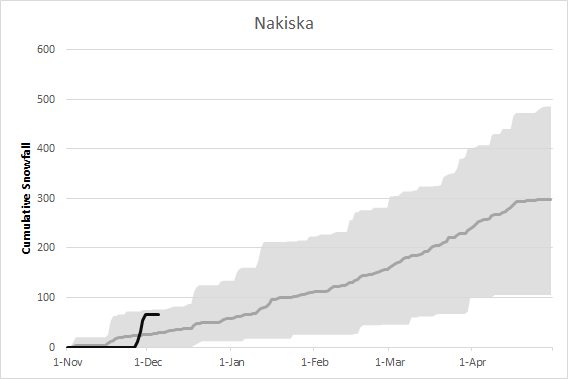 Nakiska's almost doing the best for this time of year out of any of the last 7 years! Good for it. They tend to have more variation at this time of year than other Alberta hills too, so it's actually a bit tougher to say if they'll have a good season or not. 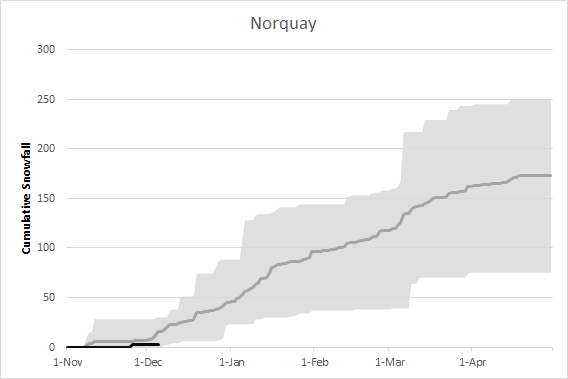 They tend not to get a 100 cm base until around January 23rd, and have very unpredictable seasons, with a coefficient of variation of total snowfall of 48.2%. Norquay's a bit sad. They're well within previous years' ranges, but it's still not looking nice. 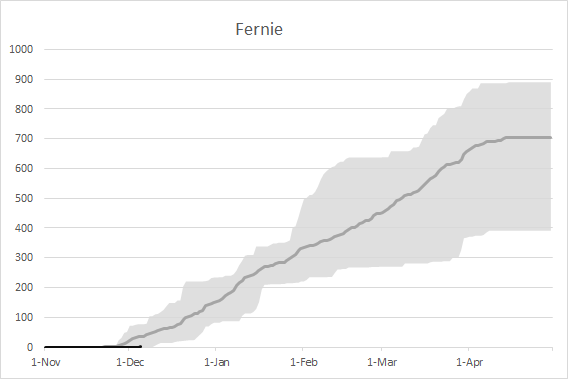 They'll get their first 100 cm on average by February 10 (yikes), and have a variation in total snowfall around 37.6%. Some years they don't even get 100 cm of snow, though. 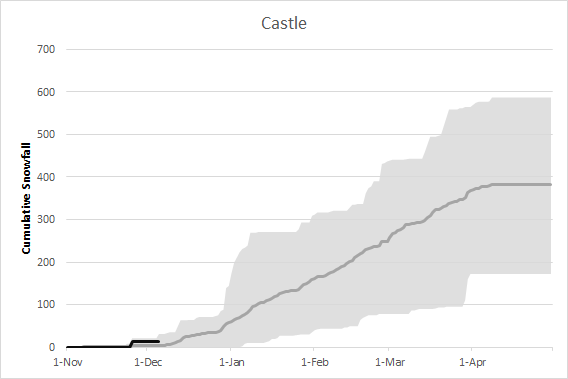 Castle Mountain's another sort of sad mountain with a later season (100 cm average by January 11th) and high variability between seasons (43.2%). Both Castle and Norquay seem to have missed the awesome snow dump that the rest of Alberta had, but are tending to stick a bit better into where they'd be expected at this point in the season. So overall for mountains in Alberta, it's looking like now is a great time to go to Marmot, Sunshine, Lake Louise, or Nakiska. They're certainly at least all doing much better than average for this time of year, and will likely continue to be above average for the rest of December. (100 cm by November 24, average snowfall 796 cm, COV 27.7%). Both mountains consistently and reliably get far more snow than anything in Alberta. While that may make them sound great on paper, they still haven't had the trend-bucking dump that Alberta mountains have had, and are currently lagging quite far behind their Alberta peers. So while I can't guarantee that they'd have particularly good December skiing this year, you certainly ought to be able to rely on them for quality skiing in the mid- to late-season!